You can use our Star Analyser 100 or 200 or Rainbow Optics Star Spectroscope with a DSLR to produce wonderful spectra. Although some amateurs have also gotten good results with the Rainbow Optics Spectroscope grating, we prefer the Star Analyser grating because it was designed by a knowledgeable spectroscopist. He created the Star Analyser specifically for the kind of spectroscopy done by amateur astronomers. Have a telescope and cooled astronomical CCD camera already? 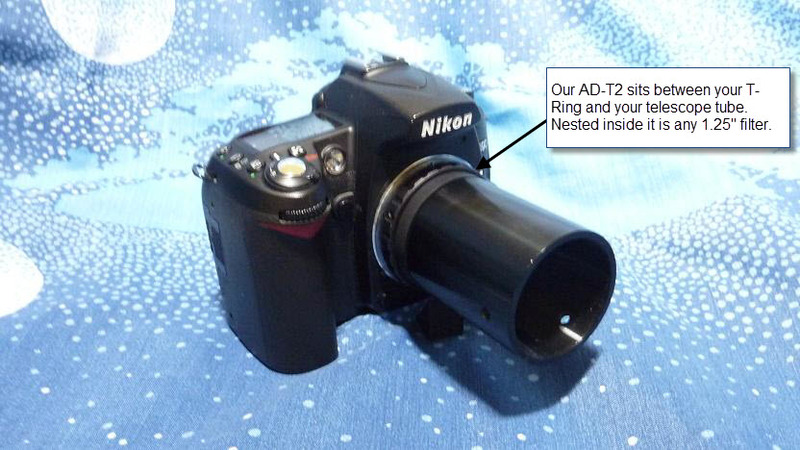 Then just screw a grating into the camera nose or your filter wheel. You can easily process the resulting spectrum (rainbow) into a scientific graph using our RSpec software. See this short Sky & Telescope video interview. Our tutorial videos (link) and active forums (link) make it easy for you to get started. You don’t have to be a post-doc researcher with a big budget. This isn’t your father’s spectroscopy anymore. These days, it’s surprisingly easy. You can capture images like this with your DSLR. 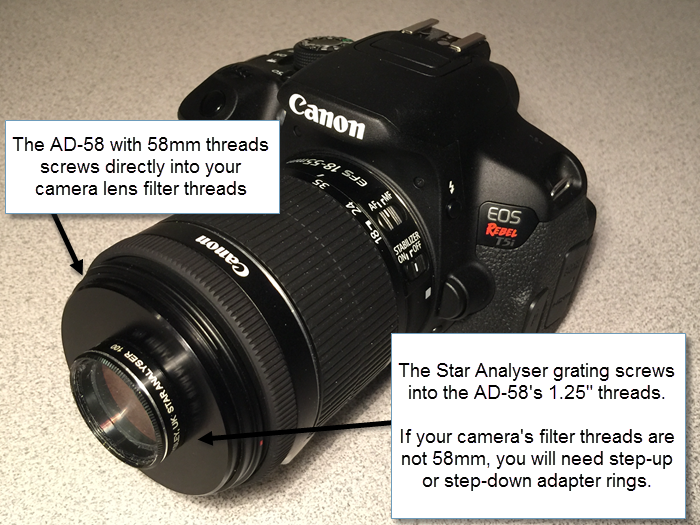 The AD-58 adapter attaches a Star Analyser or Rainbow Optics grating to your DSLR lens. (See photo below.) This is called an “objective grating” configuration. It produces spectra that are two or three times better in resolution when compared to mounting your grating between a telescope and camera. 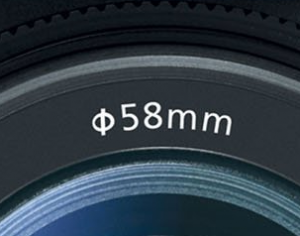 Cost for the AD-58 is only $38 plus shipping and handling. Available now! Click here to order. 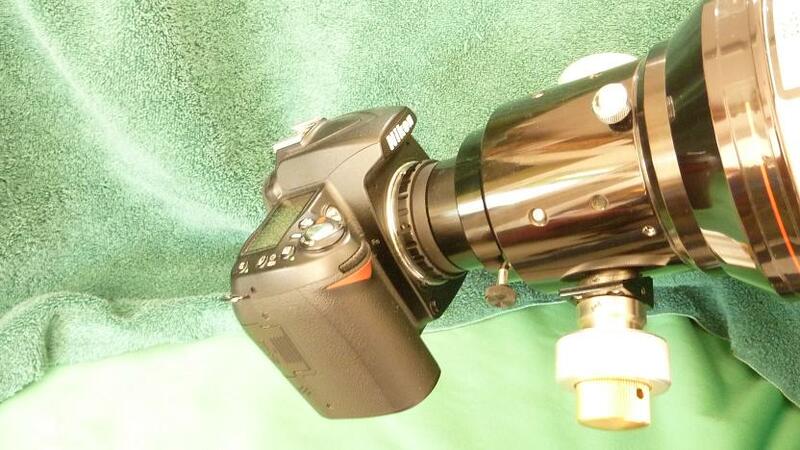 Need Custom Parts for mounting your Star Analyser on your camera? We are big fans of PreciseParts. They’re professional, friendly, and make great custom parts. They specialize in astronomical equipment. Their site has an excellent online tool to design your custom parts. Or you can contact them directly for ordering: http://preciseparts.com. 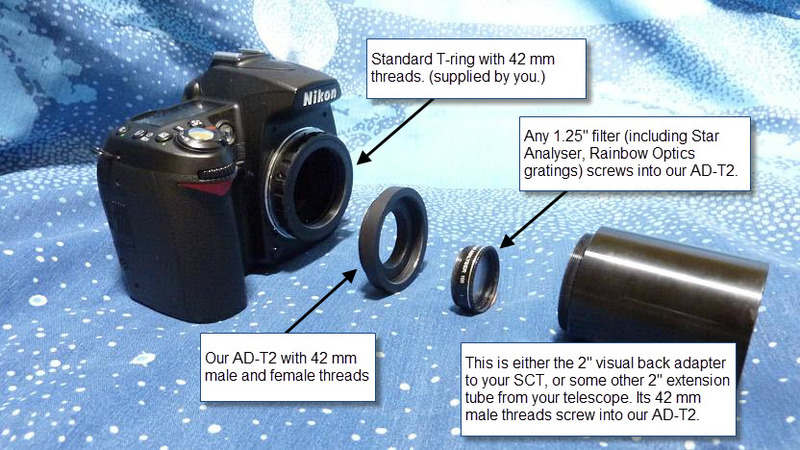 Cost for the AD-T2 is only $38 plus shipping and handling. Available now! Click here to order.